This is the fifth in a series of visualizations on legal employment outcomes for the Class of 2017. Following posts on outcomes in Florida, Pennsylvania, Texas, and New York, here is a visualization for legal employment outcomes of graduates of Illinois law schools for the Class of 2017. (More about the methodology is available at the Florida post.) Last year's Illinois post is here. There were around 1750 graduates of Illinois's 9 law schools, down from around 1820 last year and 2040 in 2015. That's helped placement in bar passage required and J.D. advantage jobs rise to 79.3% (including a few school-funded jobs), up a point over last year. Overall jobs declined slightly. This is the fourth in a series of visualizations on legal employment outcomes for the Class of 2017. Following posts on outcomes in Florida, Pennsylvania, and Texas here is a visualization for legal employment outcomes of graduates of New York law schools for the Class of 2017. (More about the methodology is available at the Florida post.) Last year's New York post is here. There were around 3650 graduates among New York's 15 law schools, down from around 3800 last year and around 4500 for the Class of 2014. That's helped placement in bar passage required and J.D. advantage jobs rise to 84.5%. Only NYU and Columbia still report any meaningful school-funded positions (and also accounts for disparity between the chart and the table below). Overall jobs rose slightly. This is the third in a series of visualizations on legal employment outcomes for the Class of 2017. Following posts on outcomes in Florida and Pennsylvania here is a visualization for legal employment outcomes of graduates of Texas law schools for the Class of 2017. (More about the methodology is available at the Florida post.) Last year's Texas post is here. This is the second in a series of visualizations on legal employment outcomes for the Class of 2017. Following a post on outcomes in Florida, here is a visualization for legal employment outcomes of graduates of Pennsylvania law schools for the Class of 2017. (More about the methodology is available at the Florida post.) Last year's Pennsylvania post is here. Total graduates were essentially unchanged year-over-year, and the job picture improved slightly, from 82.2% placement in unfunded full-time, long-term bar passage-required and J.D.-advantage positions increased slightly once again, from 82.2% to 83.8%. Most schools are bunched together in the 78%-82% placement range. Following up on a series of posts last year (and previous years), this is the first in a series visualizing employment outcomes of law school graduates from the Class of 2017. The U.S. News & World Report ("USNWR") rankings recently released, which include data for the Class of 2016, are already obsolete. The ABA will release the information soon, but individualized employment reports are available on schools' websites. The top chart is sorted by non-school-funded jobs (or "full weight" positions). The visualization breaks out full-time, long-term, bar passage required positions (not funded by the school); full-time, long term, J.D.-advantage positions (not funded by the school); school funded positions (full-time, long-term, bar passage required or J.D.-advantage positions); and all other outcomes. I included a breakdown in the visualization slightly distinguishing bar passage required positions from J.D.-advantage positions, even though both are included in "full weight" for USNWR purposes (and I still sort the chart by "full weight" positions). The table below the chart breaks down the raw data values for the Classes of 2016 and 2017, with relative overall changes year-over-year, and is sorted by total placement including school-funded jobs. The columns beside each year break out the three categories in the total placement: FTLT unfunded bar passage required ("BPR"), FTLT unfunded J.D. advantage ("JDA"), and FTLT law school funded BPR & JDA positions ("LSF"). The first state is Florida (last year's visualization here). Western Michigan University-Cooley's Tampa campus did not disclose campus-specific data again this year, so I did not include it. There were 2236 statewide grades, a 10% decline over last year's class. The total placement rate among the graduates was 69.8% with just one school-funded job. That's more than a 4-point improvement over last year, with an assist from the decline class size: total placements shrunk from 1621 to 1561. Importantly, however, J.D. advantage placement dropped from 275 to 196, while bar passage required placement rose from 1346 to 1364. As always, if I made a mistake, please feel free to email me or comment; I confess there are always risks in data translation, and I am happy to make corrections. Will any law schools close as a result of the decline in enrollment and the lingering effects of the 2008 recession? This was how I began a draft of a blog post five years ago. (And that I'm finally revising....) It's a little strange, perhaps, now, to link some of the present status of legal education to an economic event ten years ago, or that we've been discussing the same decline in enrollment problems for many years. In part, I confess, I had deep skepticism that any law schools would close--at least, any accredited law schools. From my research, I couldn't find a single ABA-accredited law school that had ever closed. The ABA has been accrediting law schools for about a hundred years, and there had been closures of non-accredited or state-accredited schools. I wondered, then, what closures might look like. I had compiled a few of the most notable predictions concerning law school closures a few years ago. As large law firms continue to hire fewer highly paid associates, law school applications will eventually drop and the number of law schools will likely contract, two professors predict in a recent article. I'm not saying law schools will go away -- the prestigious ones, especially, will probably come out just fine -- but vast swaths of it [sic] will probably disappear. My own opinion was that we'll see several law schools close during the next decade, but probably not more than ten--and that was the majority view among readers by a wide margin. Most vulnerable are going to be free-standing law schools that are relatively young. Relatively young law schools part of universities that are in vulnerable financial shape are also likely candidates. Cooley closed its Ann Arbor branch campus in 2014, but that was a branch campus, not a full closure. William Mitchell and Hamline announced a merger in 2015, but I wasn't inclined to call that a "closure," despite two schools becoming one school. And, that said, enrollment looks more like the size of one school than two schools put together. Indiana Tech announced its closure in 2016--but, in part, I discounted that closure because the school was not fully accredited by the ABA--only provisionally. Whittier announced its closure in 2017, and there was the first fully ABA-accredited institution to do so. Charlotte announced its closure in 2017, a second fully ABA-accredited institution, and the first for-profit law school (six for-profit law schools arose since a consent decree in 1995). Valparaiso announced in 2017 that it would not enroll an incoming class and was looking for future options for the school--whether closure or selling the institution. And just yesterday, Savannah announced it would be closing--a branch of Atlanta's John Marshall. It's been a trickle of closures--a merger, a couple of branch closures, a suspension of admissions, a couple of outright closures. It's hard to portend what else might come. Arizona Summit and Thomas Jefferson are on probation status with the ABA, but that might change. Concordia, Lincoln Memorial, and North Texas are provisionally accredited, and we might see an update on their statuses soon. And there might be fully-accredited schools out there making difficult decisions. Professor Jerry Organ in 2014 presciently compared a historic decline in dental school enrollment and ultimate closures with what he saw to be possible future closures in legal education--the tail was long, he emphasized, before the true change in the quality of students and the long-term financial pressures closed dental schools. Here we are, a decade after the recession, and we are seeing some of the consequences. Yes, next year appears to be a relatively good year for law schools compared to the last several. But that is probably not enough to change what might be still future difficulties at many institutions. Only sustained long-term growth in quantity and quality of law school applicants, driven by a market desire for more such law graduates, will bring much-needed stability. Recent data from the Law School Admissions Council shows that Law School Admissions Tests administered in December 2017 were up an eye-popping 27.9% year-over-year. It's worth digging a bit into the figures to see what that really means. First, they're up slightly more in the United States than Canada--recall that this figure includes all LSATs administered. This represents an increase of 29.1% in the United States year-over-year. But, second, it represents a slightly less impressive total among first-time test-takers. Recall that the LSAC, as of September 2017, allows test-takers to retake an unlimited number of times. Because LSAC reports the highest score to schools (which is less reliable than the average of scores), there is increased incentive to retake tests. First-time test-takers increased 24.0% year-over-year, but repeaters increased a whopping 35.8%. That said, 24% year-over-year increase in first-time United States test-takers is nothing to scoff at. Third, the quality of applicants is up year-over-year. Those with an LSAT score of 160-164 are up 10.2% year-over-year as of February 21, and those with a score of 165-169 are up 22.8%. The lowest scores have seen a slight decline in applicants. This is very good news for the best law schools. Of course, the open question is what happens now: do the very good law schools that have shrunk in recent years maintain their size and improve quality, which trickles down to the benefit of many other schools? Or do those schools increase their size and seize the greatest advantage from the improved quality? Time will tell. Of course, these projections may change dramatically. 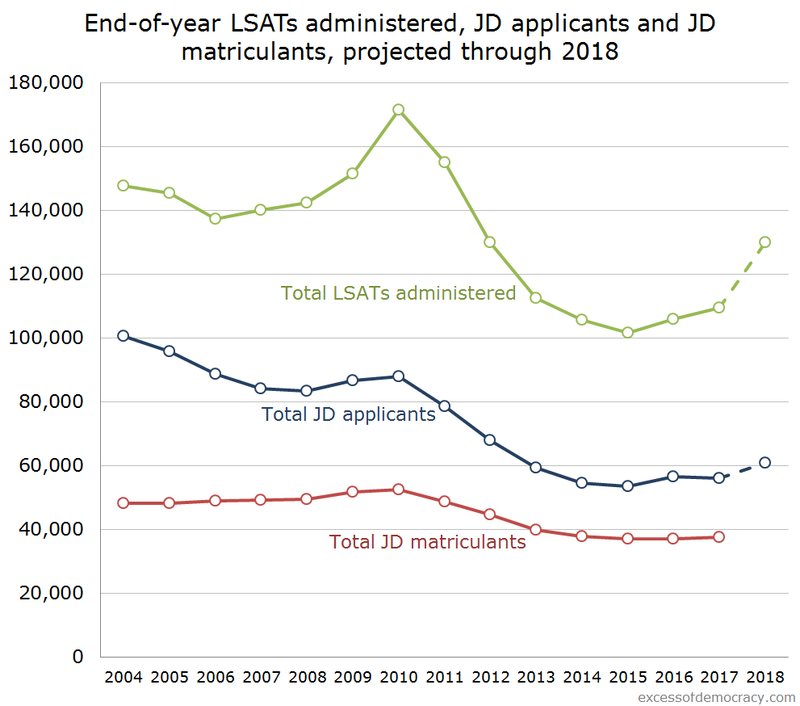 We may see more applicants (but not as many as the increase in LSAT test-takers, for reasons noted about the higher increase in repeaters than first-time test-takers). But, the advent of the GRE in admissions in law schools may mean that these LSAT figures are less predictive than they once were, and we may see more GRE-only applicants. Time will tell. In short, the figures offer, with some nuance, an overall good picture for legal education generally for the incoming Class of 2018 (including the cohort taking the bar exam in July 2021). How that translates into individual schools, and how precise these figures look in the months ahead, remains to be seen.